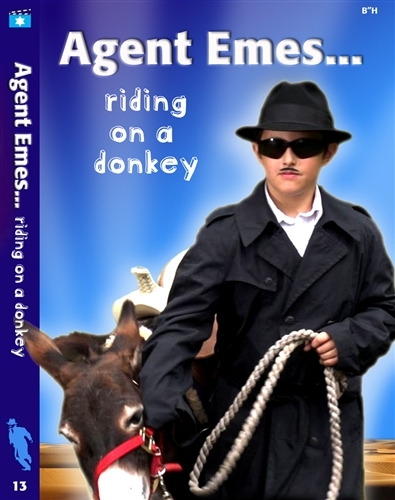 Agent Emes 13: Riding on a Donkey – Ships Today! Close encounters with farm animals – and lots of them. With cousin Pinny’s birthday party fast approaching, Benzi Epstein is in high alert for a possible attack by Uncle Evil, dreaded leader of Aveiros International. But why, af all things, is Uncle Evil pursuing a simple donkey? That’s what Agent Emes has to find out before it’s too late to save not only humanity, but the entire world! Helped in part by the wacky inventions of secret Agent Hay-Hay, Agent Emes narrowly escapes Uncle Evil’s fiendish trap, and saves the day once again! This episode features gadgets, jokes, humor, and action galore, with a (spiritually) healthy mix of Jewish tradition and thought mixed in along the way. Special features include blooper reel, a full clown performance by “Ko-Ko” the Clown, a guest appearance by Dovid Taub (creator of Itche Kadoozy) and original music by Andy Statman.